On Saturday I spent the day on a dead-end street in a remote portion of West Philadelphia helping fellow Everyhere Logistics crew build out the interiors of their box trucks. Years of computer work and questionable life decisions have left my hands baby-soft, so one of my first purchases on the tour was a pair of work gloves. There’s nothing to be done for my wardrobe, which consists of fine poplins and linens (but so breathable!) And my wool fedora, which is sweltering and not very practical. I’m already aware that I am a bit of a dandy and a dilettante, and that in a prior life I was probably an incompetent and corrupt colonial administrator for the British empire. That being said I have enjoyed the work so far—lots of heavy lifting, hammering, and the like. It is good, after years of moving digits around on the Internet, to actually do something. Toward evening a steady stream of trucks and vans began arriving. 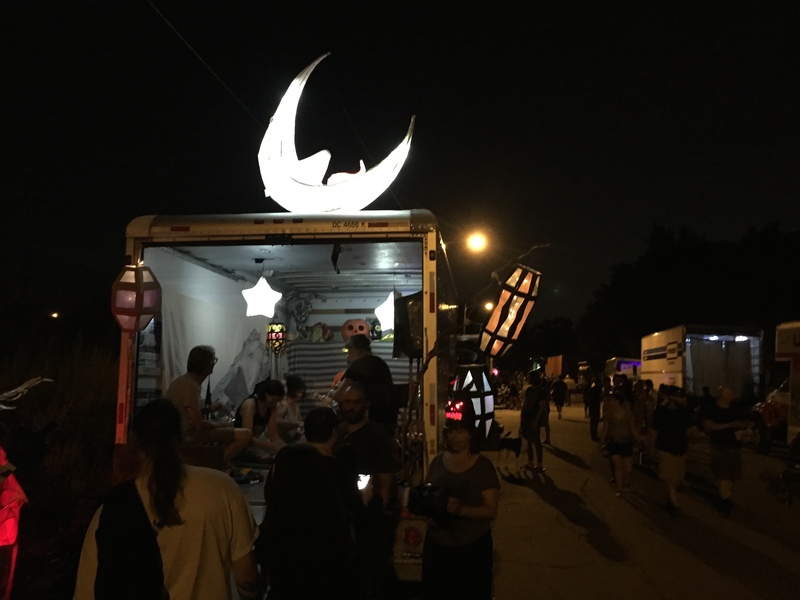 They were our Philadelphia hosts—the EverNever Night Market. Around 8pm, with the sun mercifully setting, I suited up and joined the Everyhere Logistics Travel Agency truck, where I served as a travel agent for the evening. My job was to interview our travel “clients,” and I was astonished by the Philadelphians I met. They were a curious mixture of reserved but highly adventurous (adventure being a key attribute we look for in our travel clients.) I met a women who has ridden the rails like a hobo of yore. A young guy maybe 20 years of age who explores abandoned buildings and documents street art. And a traveling contortionist who changes cities about once a month. And at the end of the night, as we were cleaning up, I kept coming across strangers who were volunteering to help cleanup. You’re A-OK in my book, Philadelphia. ← 2011 LHNM Detroit – Simmer’s perspective.